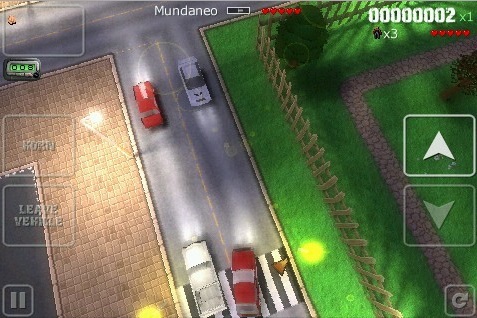 Squash pedestrians, lose the cops and score mad cash in Apex Designs' open world iPhone game. Indulge your inner criminal with Payback from Apex Designs, a Grand Theft Auto-inspired video game that lets you complete missions for seedy characters, terrorize civilians and evade the law. Powered by an impressive 3-D engine and slick controls, the game satisfies our need for an open world adventure on the iPhone despite a few bothersome issues. Payback closely resembles the original Grand Theft Auto, thanks to its top down perspective and pixilated 3-D graphics, and just like Grand Theft Auto, you're free to gun down pedestrians, carjack vehicles and run errands for lowlifes. In this case, however, you have 11 different cities to explore, and you unlock them by earning points; you do this by slaughtering passersby and completing jobs. You'll also acquire a series of weapons, such as grenades, a pistol and a shotgun; the developers put this stuff in breakable crates. Just be careful with how many folks you kill. Slaughtering people is a great way to pass the time, but doing so will attract the cops. Of course, if you're into high-speed chases, simply hop into the nearest car and run from the law. The game comes with three modes: Story, Challenge and Rampage. Story, the heart of the game, sends you on various missions you receive via payphone. Challenge and Rampage feature shorter objectives; think of them as a quick play modes for points. Finally, Rampage allows you to run amok and cause mayhem, the goal to wrack up as many points as possible before death. Overall, Payback plays surprisingly well. You maneuver your character (or vehicle) by pressing up and down arrows on the iPhone's screen and turn by physically maneuvering the device. At first we were skeptical, but quickly grew to like the controls, especially while driving; you'll make hairpin turns and thread the needle between two cars in no time. We also dig the 3-D graphics. Each city features detailed buildings, parks, trees, benches and plenty of traffic/pedestrians. Everything looks pixilated, but considering the platform, Apex Designs did great work. As for the audio, the cheesy hip-hop cannot compare to today's Grand Theft Auto soundtracks, but it doesn't annoy us so much that we kill the volume. So now onto Payback's shortcomings, of which, there are a few. For starters, it's almost impossible to tell pedestrian from police officer unless you actually see the cop get out of his cruiser. That often forces us into a shoot first style of play that often backfires. In addition, the main character has poorly animated and ridiculously long legs that stretch out with each step, and the game lacks sufficient lighting. Oftentimes, we'll make a wrong turn and get trapped within a building's shadow, unable to find our way out. Targeting (or lack thereof) is another drawback. Lining up our shots takes a lot of patience and occasionally results in our demise. If anything, Apex Designs needs to release an update with a lock-on system. We can also do without the cornball voice acting, but that brings up another valid criticism. Payback, although it resembles the Grand Theft Auto series, lacks the franchise's phenomenal presentation. You'll never see attractive illustrations, engaging cut scenes and other assorted visual bells and whistles that draw you into this interactive world. As a result, it feels like a cheap knockoff. Finally, the game's designers failed to innovate. There's just nothing new and exciting about Payback. You find weapons in crates, complete the same old missions and do the same things we've done countless times before. We know it's a port of an old game, but come on. Give us something different. That said, Payback is still a thoroughly enjoyable action game that's worth your $6.99. It's just fun to see something like this on the iPhone, and we hope that it convinces Rockstar to trump Apex Designs with a new Grand Theft Auto. For now, though, Payback is the next best thing. 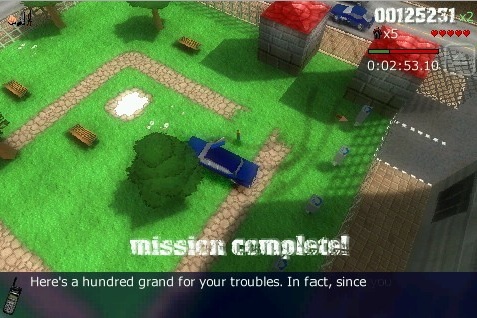 What's Hot: Solid controls given the platform, lots of missions to complete and vehicles to steal, GTA-style play. What's Not: Some areas are too dark, no lock-on targeting, characters too small to make out, cheesy voice acting, you cannot play your own music.